Taking accurate, regularly-scheduled samples is vital to maintain quality. That’s why we made it easy to schedule samples automatically in real-time using the SPC Module. 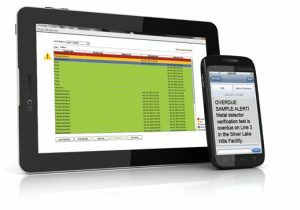 You can take samples based on actual production conditions and use convenient, automated alerts to help ensure that samples are never missed. Customizing a sampling schedule is simple and totally flexible, empowering you to accommodate the requirements of your unique production environment. The Sepasoft SPC Module makes it easy to ensure that samples are taken on time. A samples list shows upcoming, due and overdue samples by department or location so you can quickly see what’s happening. The system can also automatically send out email and SMS notification or flash screen indicators to prompt sample taking. You even have the option of setting up the system to automatically stop production if a sample is overdue. When samples are taken, the SPC Module can be set up to automatically approve them or hold them for approval. This feature can help you ensure that samples are approved when and how you need them to be. You can easily create sample definitions to define attributes, control limits, signals and sampling locations. Choose attributes from variable data types such as real, integer, boolean and many more.